Domestic animals like our beloved pups are used to the comforts of home. Simply sleeping on a cold, hard floor or outside on dirt or grass is not enough for man’s best friend – especially the more pampered among the like. Choosing a great bed is not only for their comfort, it can also help them live healthier lives. There are many important factors to consider when choosing the perfect bed for your pup, and we’ve set out to guide you through the grey areas. With a little help, you’ll be on your way to finding the best dog bed for your favorite canine. A dog is your companion and best friend. Your puppy will greet you happily in the morning and after a long day, and you want to provide for your their every need. This is why many people find it ideal to keep a dog bed in the home. Privacy: Dogs need their own space the same way that humans do. A dog bed can give them a sense of privacy and security by giving them a place to call their own. Comfort: A bed they can snuggle up in will not only keep them warmer than the floor will, it can also help cushion their joints and relieve pain, especially for older dogs with arthritis. Cleanliness: Not only is a dog bed good for pups, it’s also beneficial to their owners. Confining pet fur and dander to a dog bed eliminates the need to constantly vacuum fur off of couches and beds. Some dog beds even come with removable covers that are easily machine washable, making cleanup even simpler. Dog beds are made from a variety of materials and come in all different shapes and sizes. There are literally thousands of beds to choose from, so placing them into specific categories and matching them to each dog’s specific needs will help to narrow down the selection. 1. Orthopedic dog beds: These are great for older pets that have arthritis or musculoskeletal issues because they are made with thicker foam to provide extra support and comfort. They usually have an entrance with a shorter side to make entering and exiting the bed easier on joints. 2. Heated dog beds: Also beneficial for senior dogs, heated dog beds come with electric coils that provide a gentle heat while the pooch is sleeping. Smaller dogs that have trouble regulating their body temperature, and dogs that sleep in a cooler climate or outdoors would also benefit from a heated dog bed. 3. Pillow dog beds: A pillow dog bed is exactly that, a bed that has a similar structure to a regular bed pillow in terms of thickness and shape. The bed conforms to the dog while sleeping, cradling them and providing an extra level of comfort and security for them. Some come with sides, which is great for dogs that like to lean against something while sleeping. 4. Elevated dog bed or cooling cot: Known for their durability, elevated beds, also known as cooling cots, are perfect for outdoor use or for regulating a dog’s body temperature. Their unique design keeps the dog off the floor by using an elevated platform usually made of thick plastic or metal. They are often made of a waterproof, breathable fabric which is ideal for using outdoors or in warmer weather. Since the dog is elevated off the ground, air is allowed to flow freely all around the bed, keeping the dog cool in even the warmest weather. 5. Crate mat: Generally thinner than other dog beds, a crate mat is flexible enough to use when lining a crate or carrier. Instead of placing a towel or blanket down, a crate mat provides the dog with a bit more support and comfort. They are also useful as a spare bed, outdoor sleeping area, or travel bed. Before choosing a dog bed from one of the above categories, there are several factors that should be considered. This could include where a dog sleeps, how they sleep, the dog’s age and specific health needs, how big the dog is, the dog’s strength and activity level, and what the budget is for the dog bed. Location: Where a dog sleeps is important when choosing a bed because the bed will need to fit appropriately in the space provided. Measure the area ahead of time to determine if the dog bed will fit. Also, if the bed will be located outdoors, in the garage, or basement, consider an elevated bed so that the bed doesn’t have to be placed directly on the ground. Sleeping style: If the dog likes to sleep sprawled out, a larger bed will be ideal. Conversely, if a dog prefers to sleep curled into a ball they may prefer a more plush bed or one with sides that will hug them while they sleep. Age and health: An older dog may benefit from an orthopedic bed or a bed with lower sides that is easier for them to enter into. Beds that have medical-grade foam or extra supports added during construction can also help relieve joint pain and muscle weakness. Size: A large dog will need a bed that they can fit comfortably in. Before choosing a bed, measure the dog from head to tail to see how much space they will need. A smaller dog may feel overwhelmed and uncomfortable in a large bed, so they may do best with a smaller or medium sized bed. Activity level: If a dog is extremely strong and active, a fluffy dog bed will be ruined within minutes. Choosing a durable bed with sturdy construction will help the bed last longer and avoid a mess of foam all over the living room. Budget: The more bells and whistles a dog bed has, the more costly it can become, so choosing a bed that fulfills all the essential needs first is ideal. Since dog beds will need to be replaced over time, choosing a bed that is comfortable, durable, functional, but also budget-friendly is important. Microfiber: A material known for its durability and softness, microfiber is also very breathable and helps wick away moisture while the dog is sleeping. Fleece or flannel: These materials are extra thick, allowing for added comfort and warmth, especially for dogs living in cooler climates. Suede: While it’s not easy to clean, this fabric is extremely soft and can help a pooch get a great night’s sleep. Nylon or vinyl: These thinner materials are easy to clean, durable, and breathable. They help keeps dogs cool, which is ideal for warmer climates. They are often waterproof as well, making cleanup a breeze. Dogs with allergies also might benefit from these fabrics because they are hypoallergenic. Foam: The most common type of fill, this material conforms to the dog, allowing for extra comfort and support. Orthopedic beds often come with a special medical-grade foam which is approved for arthritis and other joint problems. Polyester: This material looks a lot like cotton balls, and is also used inside stuffed animals. While it is soft, it’s not very durable so it’s best for smaller, gentler dogs. Cedar: Some dog beds are filled with cedar wood chips. While they may not be as comfortable, they are great for keeping insects like fleas and ticks away. They also help wick away moisture and eliminate unpleasant odors. Recycled materials: In some instances, recycled materials like plastic bottles are used to fill dog beds. This is not only eco-friendly, it’s also more durable and cost-effective. Each dog bed comes with a different set of instructions for keeping it in tip-top shape. Choosing a dog bed that comes with a machine washable cover can help make cleanup quick and easy, while also making the bed last longer. 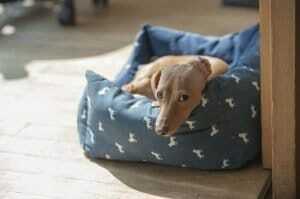 Dog beds should be cleaned regularly, the same way sheets are changed on a regular bed. This will help eliminate odors, prolong the life of the dog bed, and keep the dog feeling comfortable and at home in their bed. This orthopedic dog bed from Big Barker has 7″ of therapeutic foam that meets all CertiPUR-US standards. The 7″ of foam consists of 4″ of comfort foam and 3″ of support foam, ensuring that dogs up to 300 lbs are fully supported each time they sleep on it. The 100% luxurious, microfiber cover is easy to remove and machine washable. Each bed is handmade in the United States with the finest materials. The materials used do not emit any chemical smells, which can be irritating to both dogs and humans. Each microfiber cover endures rigorous testing to guarantee that the fabric will stand up to scratching and nesting. Removing the cover is easy due to the 150 inches of zipper surrounding the bed. Once removed, it can be machine washed in cold water and dried on the lowest setting. The microfiber fabric is super durable and dries quickly, preventing the buildup of germs and bacteria. The foam used is “open cell”, which helps to keep the bed cool since air can move easily through the bed. It’s also very durable, supporting even the largest dogs for up to ten years. If the foam gets dirty, it can simply be wiped by hand with soap and water. The foam is backed by a 10 year warranty that promises the foam will keep at least 90% of its shape or the seller will replace it for free. Dogs who suffer from arthritis will love the PetFusion Ultimate Dog Lounge because of its thick, 4″ high-density memory foam which soothes even the stiffest joints. Owners will love it, too, for its easy-to-clean, machine-washable cover and modern design. The high-density memory foam is certified to last for years and comfortably cradles dogs up to 100 lbs. The foam can be spot cleaned with soap and water and maintains its shape even with the hardest digging. The dog bed also comes with an outer support bolster that is made from recycled polyfill. The support bolster provides a dog with extra comfort and a place to nuzzle or lay their head while they are sleeping. The bolsters come already loaded into the cover, but they can easily be removed when the cover needs washing. There are two, beautiful colors to choose from- chocolate and slate gray. Both colors are neutral and fit in well with any style. The modern, rectangular design allows the bed to be placed anywhere in the house. The cover is water-resistant, and there is also a waterproof liner which goes over the foam to protect it from accidents. The bed also comes with a non-skid bottom to ensure the dog’s safety on slippery floors. The cover is made from a super-soft, polyester and cotton twill blend. The durable cover is built to last, but replacement covers are available at a very reasonable cost. All parts come with a 12 month warranty which covers any manufacturers defect. Furry babies will appreciate the Baby Mattress Grade Memory Foam Base that comes with the Friends Forever Premium Orthopedic Dog Bed. The memory foam is built to last and will provide maximum comfort to dogs up to 75 lbs. It also comes with a deluxe, polyfill bolster to provide dogs with an extra area of support and a place to lay their head. The 100% suede cover is velvety-smooth and easy-to-clean. It comes with YKK metal zippers to make removing the cover simple, then it is machine washable for quick cleanup. The cover is also tear, water, and fur-resistant, making it perfect for even the toughest dogs. The memory foam mattress is protected by a water-resistant liner, keeping it safe from accidents. The mattress is made from both memory foam and support foam, helping to relieve pressure from arthritis and other musculoskeletal issues. Each mattress must meet strict standards to ensure that it withstands even the roughest sleep. It won’t flatten or sag over time like other dog beds do. The dog bed is offered in two delightful colors- pewter, which is a neutral gray, and cocoa, which is a chocolate brown. Each color goes well with any decor, making it super versatile. The cover is also skid-resistant, so it can be placed on tile and wood floors, as well as carpet. The company stands behind their product so much that each bed comes with a 1 year limited warranty and a 100% satisfaction guarantee. Man’s best friend deserves the ultimate place to sleep, and The Dog’s Bed Premium Orthopedic Waterproof Memory Foam Dog Bed delivers that. Made from 4″ of premium foam and 2″ of high-density orthopedic memory foam, this bed is a must for any dog suffering from arthritis, hip abnormalities, post operative pain, or other health problems. It’s wonderful for older dogs who have trouble controlling their bladder as it comes with a washable outer cover and waterproof inner liner. The super soft fabric is made from high-quality faux suede which delivers durability and comfort. The bed comes in five different sizes and seven different colors- brown plush, grey plush, grey with black trim, grey with blue trim, grey with green trim, grey with orange trim, grey with pink trim, brown, and grey. Replacement covers are available for purchase. Each cover and liner can be machine-washed or washed by hand, and is also easily spot-cleaned with a towel, soap, and water. The zipper allows the cover to be removed and reattached easily. Dogs who enjoy stretching out while they sleep will love this bed as it doesn’t have a bolster to restrict their movement. The soft, energy absorbing memory foam conforms to the dog’s body, cradling them while they sleep. They’ll feel like they’re sleeping in the finest five-star hotel when they lounge on this bed. The memory foam is built to last, but it also comes with 1 year manufacturers warranty for peace of mind. A dog needs a good night’s rest just as much as humans do, and with the KOPEKS Orthopedic Memory Foam Dog Bed, that’s an easy task to achieve. It comes with 7″ of plush memory foam padding, 2″ of which is comfort foam and 5″ of which is support foam. Dogs with joint or muscle pain will benefit from the medical-grade, therapeutic memory foam that is often only found in premium human mattresses. Not only does the memory foam contour to the dog’s shape, providing the ultimate sleeping experience, but the super soft micro-suede cover will have them cuddling up for hours. The bed also comes with a waterproof liner which is easily removed with the handy zippers and machine washed when needed. The cover is also machine-washable and comes in two stylish colors- grey and chocolate brown. The sleek, rectangular style and neutral color options allow this bed to fit in with any decor. One of the best features of this dog bed is the extra 3″ memory foam pillow that is located at the top of the bed. Dogs can now have the same sleeping experience as their human owners with this convenient place to rest their head. The memory foam is also hypoallergenic, making it great for dogs that suffer from allergies. The anti-slip bottom is another great safety feature, making it the perfect bed for senior dogs. This bed has it all- comfort, durability, style, and safety. Versatility, functionality, and healing are just the few of the benefits that come along with owning a Petlo Large Orthopedic Pet Bed. Made to accommodate large breed dogs, this bed features 4″ of therapeutic memory foam, 3″ of support foam, and 3″ of contoured foam at the head of the bed to provide a head rest for man’s best friend. The high-quality foam helps relieve joint pain and pressure for older dogs and dogs that suffer from physical ailments like arthritis, hip dysplasia, and other joint or muscle problems. The silky micro-suede cover is machine washable and built to endure nesting and digging. It can also be spot cleaned if needed. This bed also comes with a waterproof liner which helps protect the memory foam from accidents, spills, and tears. The waterproof liner is also machine-washable and is easily removed by the convenient zippers located at the base of the bed. Another great feature of the cover is the anti-slip bottom that provides safety on wood, tile, or other slippery surfaces. The gorgeous, rich gray color goes well in any room and the modern, rectangular design fits neatly against any wall or corner to ensure peace and privacy while a dog is resting. Dogs won’t ever want to leave this bed, with its superior softness, supportive memory foam, and large surface area for them to stretch out on. The thick, durable foam will withstand many years of sleep and won’t lose its shape, making this dog bed a great investment. High-quality, durable fabric and hypoallergenic memory foam make the Dogbed4less Orthopedic Memory Foam Dog Bed an optimal choice for any dog. Senior dogs will particularly benefit from the 4″ of non-toxic, therapeutic grade 100% gel-infused memory foam that comes with this dog bed. The gel-infused memory foam not only relieves joint pain and pressure, but it also helps regulate body temperature, keeping a dog cool in the summer and warm in the winter. The unique external denim cover is made from 100% cotton and is extremely durable. Another added bonus is the waterproof internal cover that gives the memory foam an additional layer of protection from accidents. The look of the dog bed can be changed up with the brown, micro-suede bonus cover that features an anti-skid bottom for usage on slippery surfaces. All of the covers are machine washable and easily removed with the sturdy gusset style zipper design. Each cover contains extra stitching to make it even more durable and able to withstand several washes. All materials used in this dog bed are non-toxic, making it an excellent option for dogs that suffer from allergies. Both the memory foam and covers are resistant to bacteria, germs, and other irritants. This superior dog bed is built to last and will offer comfort and healing for many years. Dogs will love snuggling up in the BarksBar Gray Orthopedic Dog Bed with the luxurious, easy-clean polyester cover and 4″ of high-quality orthopedic foam. The bed is surrounded with a padded, rimmed cushion to provide extra comfort and support to a dog’s head and neck. All materials used in making this bed are of superior quality, making it a wise investment and one that will last for years. The orthopedic foam used is of human-grade quality and is extra thick for added cushioning for ailing bones and joints. Dogs that suffer from arthritis or other health problems will find pain relief and a restful sleep with this bed. The 4″ of orthopedic foam is grooved to provide extra pressure relief for aching joints by contouring to a dog’s body and cradling them while they sleep. The extra padded rim is made from the highest quality cotton to replicate the feel of a soft pillow. A senior dog with neck problems will particularly benefit from the padded rim. Other dogs will enjoy it for an extra layer of privacy if they want to nuzzle up into it. The plush, gray polyester cover comes with a quilted design for extra style and durability. The cover can be removed simply by unzipping it from the orthopedic foam. It can then be machine washed on the gentle cycle and line dried to maintain its soft texture. Spot cleaning can be done easily with soap and water. The Suede Dog Bed by Majestic Pet Products is the perfect bed for larger dogs who like to stretch out while they are sleeping. The bagel shape of the bed provides a dog with extra security and privacy when they are resting. The padded rim can be used as support for tired necks, or as a place for them to snuggle up and enjoy some solitude. Larger dogs will delight in this extra-long, extra-wide dog bed. The length is 40″ and the width is 29″, allowing it to easily accommodate dogs up to 70 lbs. Dogs that like to dig and nest won’t be able to destroy this bed either as it is made from sturdy, high loft polyester fiberfill. The fiberfill is also made from eco-friendly recycled materials. When spills or accidents happen, there’s no worries with this dog bed since it comes with a base that is made from heavy-duty, waterproof 300/600 denier. The slipcover comes with a zipper and is made from super soft micro-suede. The entire bed is machine washable and can be placed in a large-capacity washing machine with warm water on the gentle cycle. It can then be dried on the lowest heat setting for even easier maintenance. This superior dog bed is proudly made in the United States with high-quality imported materials. Since it comes with eight different color options, there’s sure to be a style that fits with any decor. Stylish, sleek, and sturdy, the Keet Fluffly Deluxe Ped Bed and Sofa is the throne every pooch deserves. The minky dot fabric is not only ultra smooth and rich, it’s always very easy to clean. The shredded memory foam cushion is made from recycled materials and provides extra support and comfort to a dog’s muscles and joints for optimal health maintenance. The zippered cover allows the memory foam cushion to be removed for washing. The cover can be machine-washed on the gentlest cycle and then air dried to help keep its super soft texture. When it’s not in need of a full wash, the cover can be spot cleaned easily by hand with soap and water. Fur and dander can be removed with either a vacuum or lint brush. The beautiful cover sits atop a handcrafted, sturdy wood frame which is upholstered with the finest leatherette fabric. When needed, the frame can be wiped down with a mild dish soap and water to maintain it’s shiny appearance. This sofa pet bed is well-suited for smaller dogs, up to 25 lbs. The two color options, charcoal and chocolate, allow it to fit with any style or decor. It’s durable wooden legs won’t slide across slippery tile floors, making it a safe bed for any dog. Its compact size allows it to be placed anywhere, whether it be in a corner for privacy or next to their owner’s bed for comfort and security. The Blueberry Pet Heavy Duty Pet Bed is an elegant bolstered pet bed ideal for dogs that enjoy their privacy while sleeping. The high 12″ sides allow man’s best friend to feel secluded and peaceful while they are resting. Made from superior micro-suede fabric that is scratch-resistant and soft, this pet bed keeps a dog warm and cozy while also being built to last. The variety of bright colors and fun patterns truly makes this bed stand out. The luxurious cover boasts sturdy YKK zippers, allowing it to be removed easily for cleaning. It’s machine washable in cold water on the gentle cycle and is safe in the dryer on the lowest setting. The durable micro-suede fabric is also resistant to rips and tears from scratching, nesting, and digging. Micro-suede provides the beauty and feel of leather while also being breathable and stain-proof. It dries quickly, keeping it free from germs, bacteria, and odors that are often found in other pet beds. Comfort and support are provided with the 6″ of thick, microfiber fill at the base of the bed which is made from 100% recycled materials, making it environmentally friendly. The bed is easy to put together. Simply unroll the package, flip the microfiber fill over, and place it inside of the micro-suede cover. Best of all, this pet bed comes with a delightful bone-shaped pillow with a squeaker, which can be used for both nap time and play time. A relaxing oasis awaits with the Petlo Orthopedic Pet Sofa Bed. The high density memory foam, soft cover, and supportive bolster make this pet bed an excellent choice. Dogs that suffer from ailments like arthritis, hip dysplasia, or simply old age will revel in the therapeutic properties of this bed. Only the finest human-grade, high density memory foam is used for this dog bed. Memory foam is proven to reduce pressure on achy joints, soothe muscular pain, and increase energy and mobility. The thick, outer bolsters are an added bonus as they provide dog’s with a place to rest their neck or nestle their head while also promoting proper spinal alignment. The silky smooth fabric cover is water resistant, giving peace of mind for senior pets that might have trouble controlling their bladder. The cover is fully removable and machine washable, allowing for easy cleanup. It can be thrown in the washing machine on the lowest setting, then air dried for superior softness. Removing hair and dander in between washes is simple with a vacuum or lint brush. The cover can also be spot cleaned with mild soap and water when needed. The two neutral color options- chocolate brown and slate gray- allow this pet bed to fit in with any decor. The slip-resistant grip on the bottom of the cover enables it to be placed on any surface, including hardwood and tile floors. This easy-to-assemble bed is built to be long-lasting. The ultimate, indestructible dog bed has arrived with the Kuranda Dog Bed. Made with high-quality materials in the United States, this dog bed is heavy-duty and built to withstand even the most aggressive chewers. The super durable PVC frame can support dogs up to 100 lbs and is easy to clean. The unique Cordura fabric is similar to canvas in that it is sturdy and strong, resisting tears and scratches. Since the fabric slides inside of the frame, dogs aren’t able to chew on the edges in order to destroy it. It’s also slip-resistant and allows dogs to have a firm grip when getting onto and off of the bed. The solid PVC frame is virtually unbreakable. Dogs that like to chew and gnaw on their beds will have a hard time destroying this one. It’s also easy to clean and can be wiped down repeatedly without ruining the UV resistant finish. A mild dish soap and water is all that is needed for cleaning. Each fastener that holds the bed together is made from high-quality stainless steel. The elevated design keeps a dog off the floor, allowing them to remain cool and dry. Staying off of the hard ground also promotes good health and increases energy, making this a great orthopedic bed option. Each bed is backed by a 1 year warranty which protects against structural issues with the frame, damaged fabric, or destruction of the corner fittings and legs due to chewing. The JOYELF Orthopedic Dog Bed Memory Foam Pet Bed is the ideal bed for small to medium sized dogs that love to snuggle up and stay warm while also having their privacy and comfort. The thick memory foam padding at the base and plush, cotton bolster ensure that a dog is surrounded with softness all the way around. The high density memory foam is also treated with a flame-retardant to protect a dog in the event of a fire. The orthopedic memory foam helps relieve joint pressure and pain in dogs that suffer from arthritis and other musculoskeletal issues while also promoting good circulation and increased energy. The soft, waterproof cover comes with a slip-resistant backing and zippers to make removing it simple. It is easy to clean and machine-washable in cold water on the lowest setting. The cover should be air dried to maintain its cushioned, fluffy interior. Spot cleaning can be done on the inside and outside when necessary with a mild dish detergent and water. The comfortable bolster is made from 100% cotton padding to provide proper spinal alignment and extra support for a dog’s head and neck. They can also nuzzle under it if they prefer some extra privacy. Each bed also comes with an adorable, bone-shaped squeaky toy that also doubles as a pillow. The fabric used is tear resistant, making this a smart investment for dogs that like to scratch, dig, or nest. Many dog owners look for certain things in a bed that can vary according to specifics such as the local climate. This one has much to offer. An owner who lives in a damp climate that gets a lot of snow or rain, providing a dog with a bed away from the damp is a must each night. This bed has two and a half inch feet that do just that. It also has a comfortable cushion that provides further protection from the damp floor so a dog can stay dry even when there’s an unexpected leak. Owners of dog that are smaller than thirty pounds such as Yorkies and many terriers also want to provide beds that aren’t too big. With a size that measures 33.5″by 21″ by 12.375,” this bed also allows all smaller dogs just enough room for a cozy night’s sleep. The memory foam cushion provides both support and yet enough give for the dog at the same time. Hand crafted elements offer elegance and durability. The faux leather is easy to clean. Keep in mind this is not suited for larger dogs who like to stretch out. Some people do a lot of traveling. They may take their dogs with them to pet shows or just to see the world at their feet. In that case, they need a dog bed that can travel easily and yet still provide comfort and support no matter the dog is sleeping. The Brindle soft makes a good choice for the busy dog owner. It fits comfortably in a standard sized cage. No need to worry that your beloved pet doesn’t have a warm and inviting space of his own as he heads abroad an airplane or sits in your back seat. As dogs age, they may develop joint problems such as arthritis that can make it hard for a dog to get a good night’s sleep. The useful orthopedic shredded memory foam that is used as fill in this bed offers support that provides the ideal level of relaxed support for a dog of any size. When a dog lies on the bed, the foam conforms to the dog’s body shape and size, easing any pet and letting a dog drift off no matter where they are. Another useful aspect of this bed is that the cover can be cleaned easily. A single tumble in a washer and dryer and the bed is as good as new. This is particularly helpful when traveling as the traveler may not have access to laundry facilities. The bed allows medium sized completely stretch out across the entire width. In addition, it also comes complete with a three-year warranty. Potential buyers should be aware the Brindle soft does not come with a cage. The Armarkat is ideal for use for the dog who appreciates a comfortable place to relax. Dog owners can choose from multiple sizes including medium and extra, extra large thin order to find the right size for their pet. The heavy duty canvas cover stands up even many years of use and will still provide the dog with the support they need as they sleep. The pet bed has a zippered opening. This makes it easy to remove the cover for easy cleaning as needed. The waterproof lining keeps the dog warm and dry even when it’s cold and damp outside. Dogs may move around a lot as they sleep. This bed has a skid proof base. That means it won’t shift even when a dog is deep in the middle of wonderful dreams. The bed is machine washable, making it easy to care for as long as a dog uses it. Another advantage of this bed is that the stuffing used is gusseted. That means that the bed is divided into three separate sections. Dog owners can rest comfortably knowing that the interior of the bed will not clump to one side and leave open gaps in the middle. At nearly ten pounds, this bed is a bit heavier than some other models on the market but it is also quite sturdy. Some dog owners love the prospect of providing both indoor and outdoor beds for their doggies. They want to give their doggy the option of sleeping inside or outside. This is why many pet owners turn to the wood pet home. The wood pet home provides a safe and convenient space for a dog to retreat from the weather right in the comfort of their own backyard. With two separate levels, a dog can pick the exact place they would like to sleep. The top bunk has stairs that any dog can climb easily and relax in the sun. A raised floor panel in the bottom of pet home means that the dog is always warm and dry even when there’s heavy rain outside. This is a good choice for a smaller dog such as a rat terrier. The pet home is also small enough so that it can easily fit in nearly any room in the house. The beautiful, kiln dried wood is a deep warm brown that works well with many other types of warm wood tones in any space. The entire thing can be disassembled so it can be cleaned. Bear in mind that the wood pet home is not a good choice for a medium sized or even larger dog as it will not enough space inside to stretch out comfortably. Large dogs need enough room to fully stretch out each night. With a 50 inch diameter and 6 inch thick memory foam mattress, the deluxe orthopedic delivers. There’s also an inner waterproof cover so the bed is easy to wash. The plush suede cover offers an incredibly soft place for a large dog like a German Shepherd to enjoy all year long. Underneath the bed is an anti-slip bottom so the bed stays in place as the dog sleeps. Such a thick mattress offers an easy way to pamper any dog as it as comparable to mattresses that are found in human beds. Dog owners can rest assured knowing that the mattress will stay in place over time and will not shift or move even after many years of prolonged use. A zippered lining makes it easy to remove the mattress as needed in order to clean it. The mattress can be placed back in the bed and ready for the dog’s use quickly. The round shape allows bigger dogs to recline. Dogs who like to sleep curled up also appreciate the rounded structure as it gives them a sense of security. While this bed is ideal for use by larger dogs, it should be noted that it is comparatively large at over four feet in diameter. Dog owner should make sure they have enough space. Now that you’ve picked out a wonderful dog bed for your pup, why not look into more ways to spoil them? At The Pampered Pup, we review all kinds of dog related products. Take a look around, you might like what you find!